Christine and Rob had the basic concepts in mind for the mountain home of their dreams. A seamless indoor-outdoor connection. 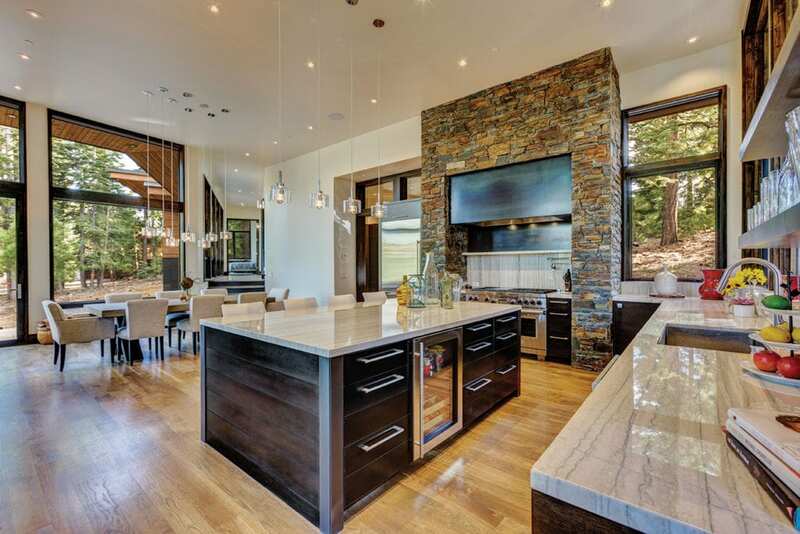 A large centralized kitchen and gathering space. Privacy for guests. A foyer. 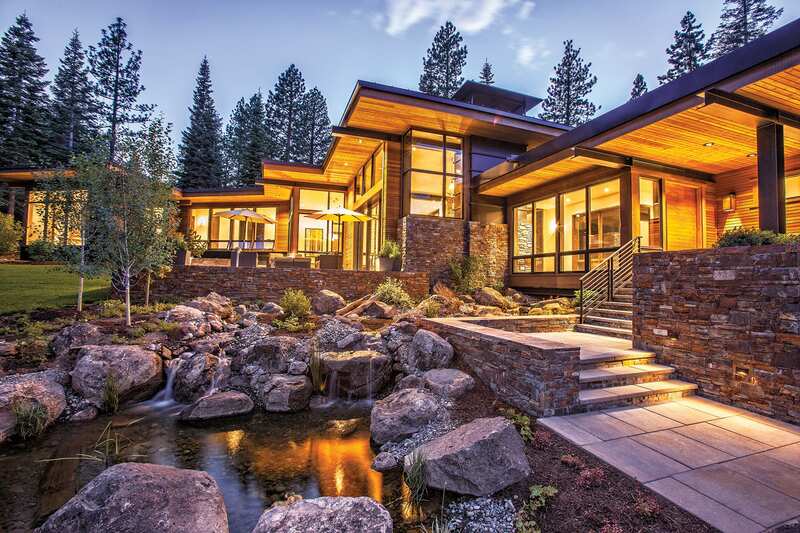 But it wasn’t until Tahoe City architect Clare Walton arrived on the Martis Camp property that their vision came into focus. 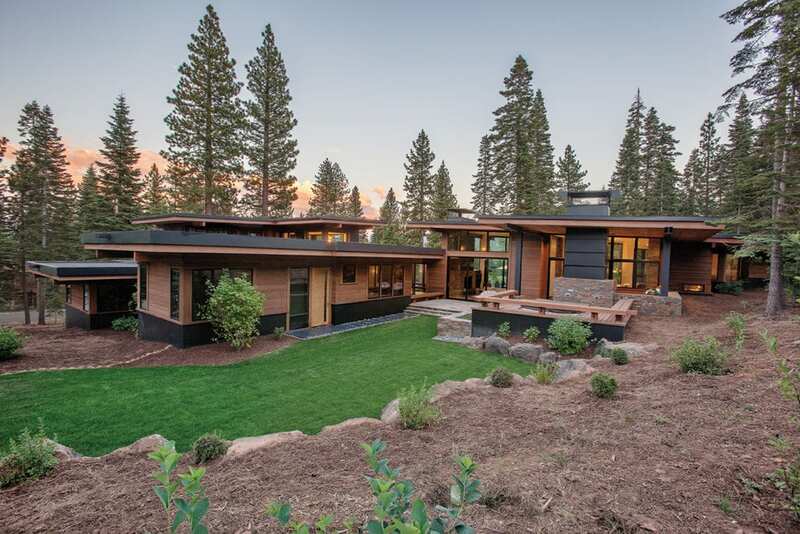 The design by Walton and her team—executed with precision by Truckee’s Gallagher Construction—called for 4,420 square feet of living space, thoughtfully laid out so the home rises gradually with the contours of the property. To achieve this, the house is split into five different levels broken up by runs of three to eight steps. In the end Christine and Rob got their centrally located kitchen and great room, off of which the master and guest wings extend in opposing directions for privacy. The indoor-outdoor connection is prevalent throughout. The foyer is there, too, although with a unique Walton touch that wows guests upon arrival. 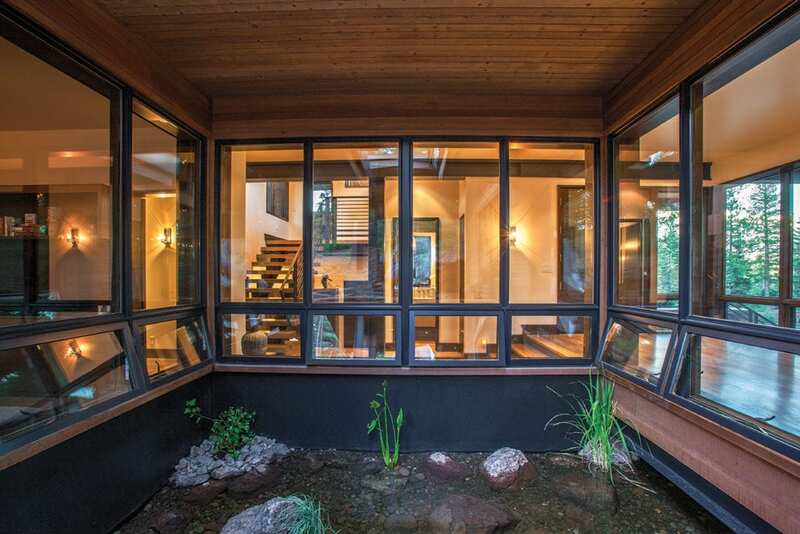 Not unusual for a Walton design, a cascading water feature highlights the main entry. It begins with a pool just inside and to the right of the hefty 5-by-8-foot front door. From there, the water flows under a bridged walkway and spills out from under the home, tumbling over rocks to another pool at the base of the entry stairs. The upper pool is surrounded on three sides by floor-to-ceiling glass, with the fourth side open to the backyard. Opposite the pool, looking left, a wall of glazing allows clear views to the front courtyard, with Northstar’s Lookout Mountain beyond. “The bridge as you enter the home with the water feature flowing underneath really sets the house and the design apart. It’s pretty awesome,” says Seamus Gallagher, president and general manager of Gallagher Construction, which often teams up with Walton on projects. Walton says she designed the water feature—which was constructed by Tahoe Landscaping and Streamscapes—to create both a visual and acoustic experience. For the latter, a band of windows wraps around all three sides of the upper pool just above ground level, all of which open to bring in the sound of the water. Meanwhile, similar low-lying windows across the bridge tap sound from the cascading waterfall. 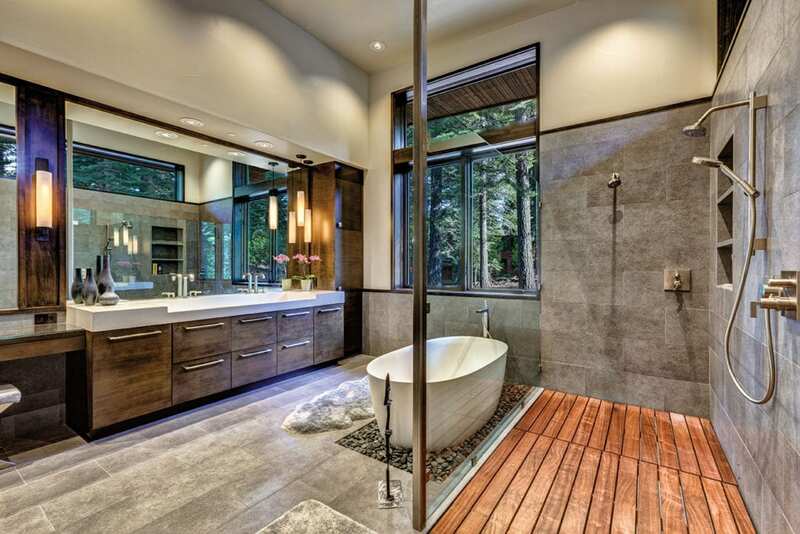 While the water feature was designed to make an impression, so too was the rest of the home. Jennifer Loving with Walton Architecture + Engineering, who played a significant role in the home’s overall architectural and interior design, says the goal was to create a clean, modern aesthetic with mountain materials. 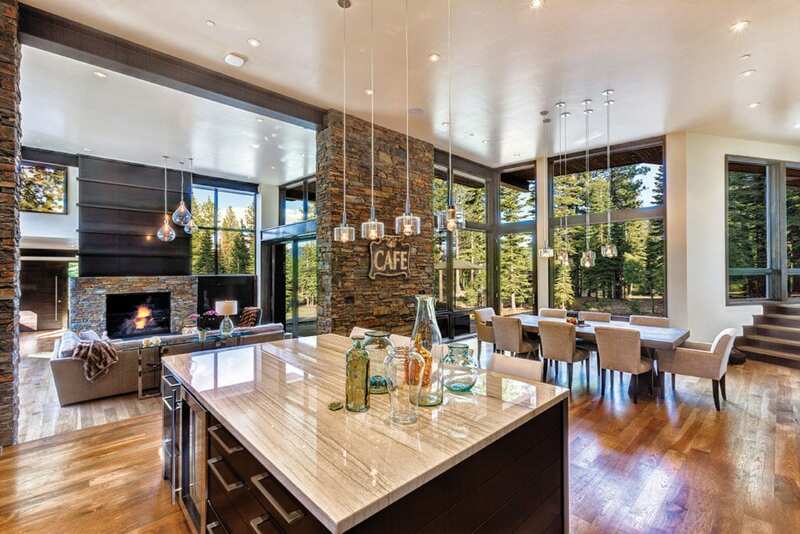 To attain this chic mountain look, the team used a complementary assortment of materials, including natural ledgestone throughout the exterior and interior, ample amounts of glass and exposed steel, clear cedar siding, clear alder on all the interior cabinetry and doors, and select hickory flooring. Knowing the selection process could be overwhelming, Gallagher took Christine and Rob around to other projects to point out various materials. The ledgestone that the owners selected takes center stage in the heart of the home. These social spaces include the lofty living room, which rises three steps through a vast opening in a ledgestone wall that connects to the kitchen and dining area, essentially creating one big great room. On the far end of the living room, nearest the foyer, a large ledgestone fireplace combines with hot-rolled steel. Straight ahead and through the opening at the far end of the kitchen, a floor-to-ceiling stone surround encases the oven and range. “These elements provide a visual balance to the great-room space, acting as focal bookends,” Loving says of the two substantial ledgestone features. 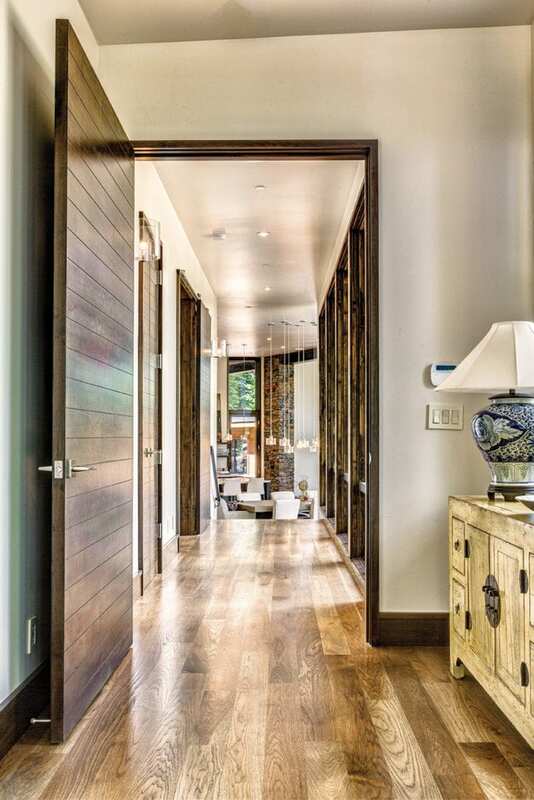 Accentuating the home’s indoor-outdoor connection, the living room opens widely on both sides through Weiland and Weathershield lift-and-slide glass doors, creating an uninterrupted vacuum of space from front to back. On one side, glass panels open to a front terrace with a fire pit and cushy seating bordered by a raised stone planter, the cascading water feature within earshot. A front lawn and landscaping were later added by Tahoe Landscaping, in addition to a number of other improvements to the lot after the home was completed. As inviting as the front terrace is, the backyard features a completely different world of seclusion. 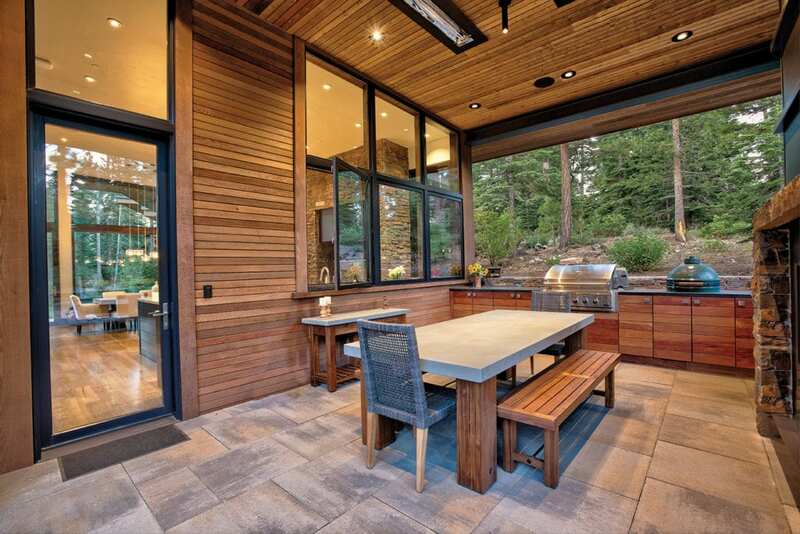 The forested privacy provides an ideal setting for a covered outdoor dining area—complete with recessed infrared ceiling heaters, a built-in barbecue and smoker, clear cedar panel cabinetry, a large ledgestone and steel fireplace (nearly mirroring the one in the living room), and a convenient pass-through window to the kitchen. A sunken spa beckons just behind the fireplace, with a lush lawn and landscaping beyond. “It’s a peaceful and secluded oasis amongst the trees for the homeowners and their guests,” Loving says of the backyard, which includes direct access to the guest wing. Among other standout features of the home, all parties involved give a nod to the kitchen island. The island is clad in hot-rolled steel and topped with the same polished quartzite, called White Macaubas, as the kitchen counters. There’s also a beverage fridge, ideally located for thirsty kitchen cooks. In hindsight, the home’s designers, builders and owners agree that project went smoothly from Walton’s first site visit to Gallagher Construction’s final screw. The end result is just as the owners envisioned and then some—and for that, they credit the expert team that pulled it all together.